This is a continuation of Part 1 of our bathroom remodel. We are jumping right into this. The room has been cleared, all the sheetrock, mud and paint work has been finished, and the floor has been cleaned as much as possible. requested from my bank in increments of $25 dollars. 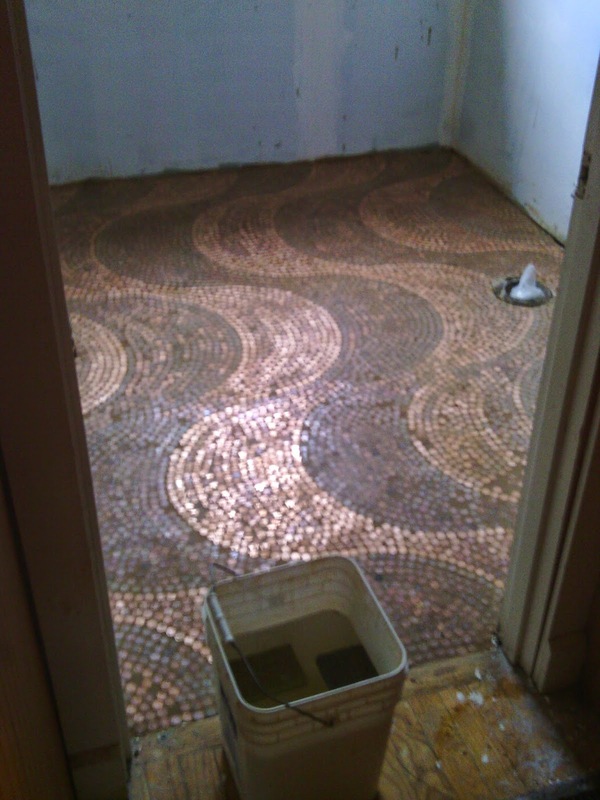 Now its time to make the floor suitable for tiling. I will give you a list of tiling supplies at the end of this post. I'm not giving it now because I wouldn't do this project again the same way. Scroll to the bottom if you just want the run down. Step 1. Make the floor as level as possible. 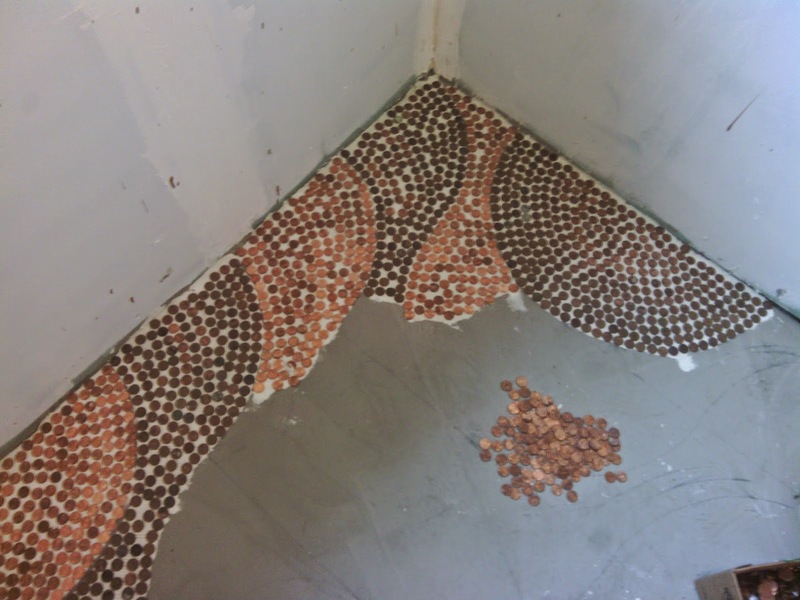 I used self leveling compound to do this.With pennies being such a small tile, it is incredibly important that the floor is very level. 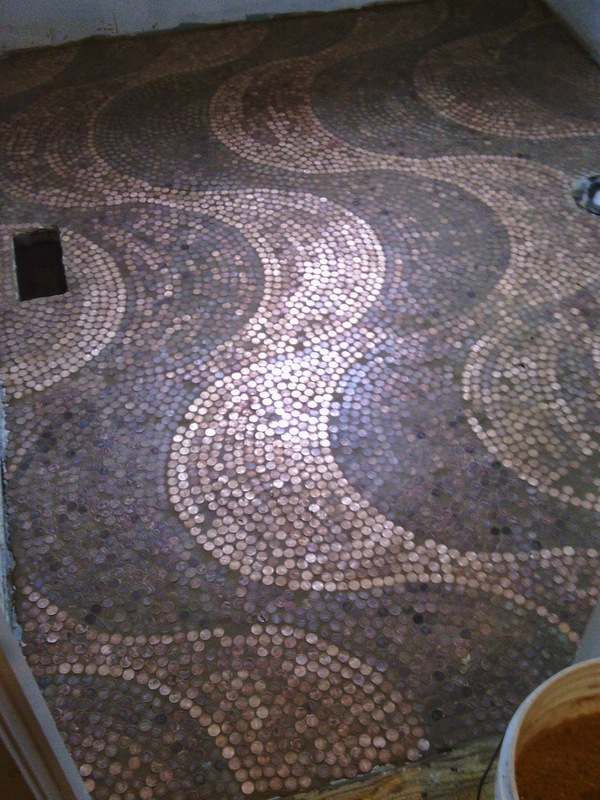 They will not sit flat on even a slightly bumpy floor and your floor will look silly and you will lose pennies later as they get bumped and knocked by normal foot traffic. Build guards out of cardboard or other materials to go around the toilet flange and inside the air duct (which I did NOT do, so trust me on this) to keep compound from running down into things... Also, if your walls to not meet the floor, you will need to put some kind of shim where there are large gaps (more than 1/8") to prevent the compound from running down to the next floor. We have wood slats under our sub floor, so the compound just dripped down to the basement until it hardened enough not to! I had shimmed some of the gaps, but apparently not well enough. This is looks to be my second layer of self leveling compound. 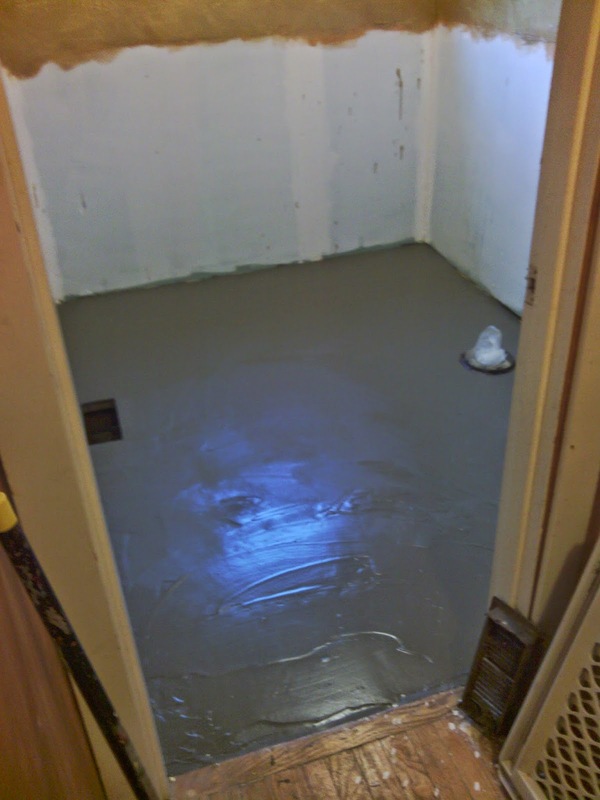 When is it appropriate to do more than one layer of self leveling compound? NEVER, really. If you have to do more than one layer, than you either a) didn't use enough the first time around (that would be me), or b) should probably put in another layer of subfloor material. My bathroom is 50 sq ft. One bag of compound covers 48 sq ft.
since my layers brought the floor up to where it should be. 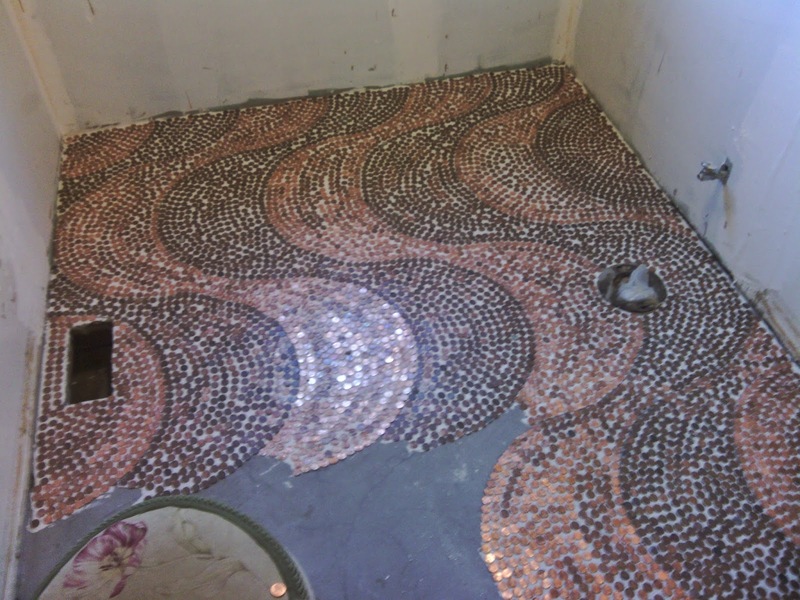 You will want the top of toilet flange and floor to be nearly flush when you are done tiling. 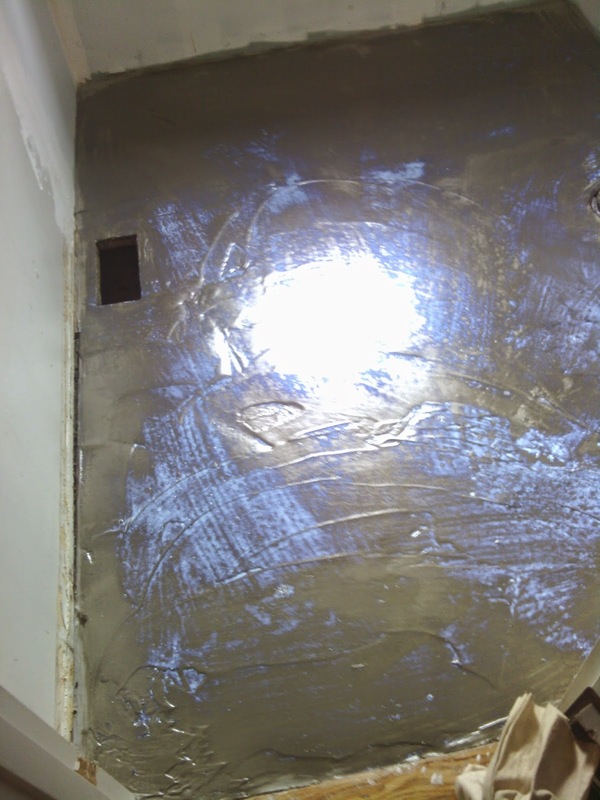 The thickness of the subfloor, mortar and tile should not be above the flange. Its all good, but could have been much easier had I slowed down and thought about it more. Last layer of self leveling compound setting up. Step 2: Adding floor primer for glass mortar. This is a latex primer that will help my mortar stick to the new compound. I did 2 coats over the whole floor. 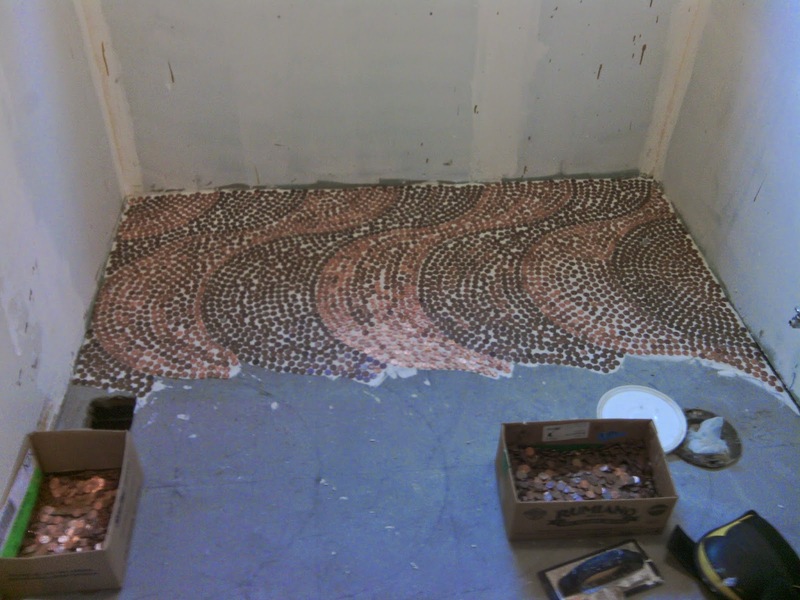 Before I began, I sorted my pennies by color. One box for light, one box for dark. 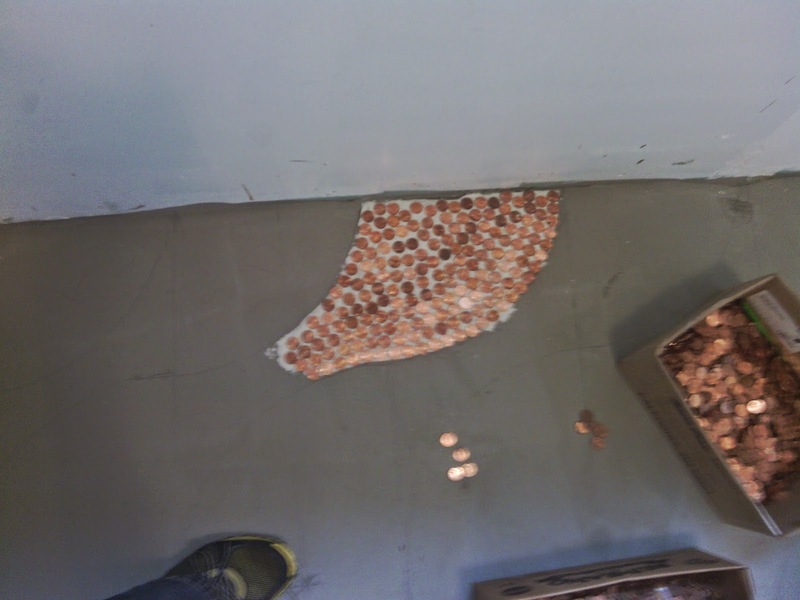 I laid the darker pennies mostly face down (my son insisted I check for wheat pennies and they tend to be dark) and the lighter ones mostly face up. Step 3: Draw out your design. What is missing here is a picture of the full design drawn on the floor in pencil. You can see a little of the lines around this pennied section. 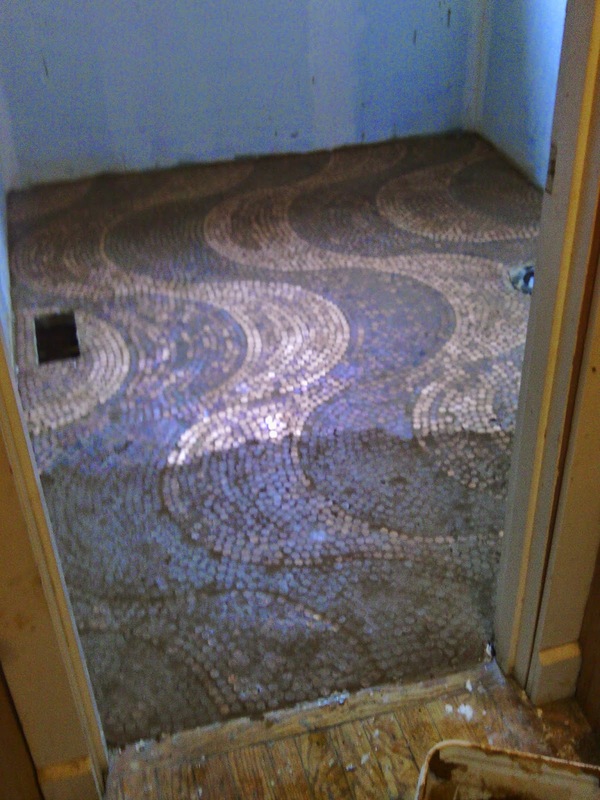 I guess you'll have to wait to see the finished floor at the end of this post! bigger template (a circle), to make a bigger wave design. The circle over lapped the previous row half way to make the consistent wave pattern. Something to consider when doing a design or pattern: how does it make you feel, how does it make the space feel? Step 4: Gather appropriate gear to for tiling. This includes knee padding or a low seat to keep you comfortable while working. I quickly realized that I needed knee pads or a short stool to do this! It was hard on my circulation to be squishing my knees like this. Knee pads were okay, but not much better. working only in that area before the mortar could dry. I applied mortar with a trowel, removed excess and then combed it with the teeth. If you have ever made anything out of clay, this step is just like cross hatching to join two pieces of clay - like a handle to a cup. and work your way across the room to the door or you will back yourself into a corner. Before laying them, I had labeled the waves with a "D" or "L" for dark and light. You will see that I flipped the pattern halfway across the floor. I intentionally did this, to break up the movement and give the eye a break. I really like it. I alternate between being a perfectionist and trying to figure out how to use what I have and make it really great, so this project challenged me to do both of those. The pennies were never consistently light or dark but varying shades. It was clear that I would end up with a bunch of "medium" colored pennies if I filled in the first area with my best "light" or "dark" for each category. 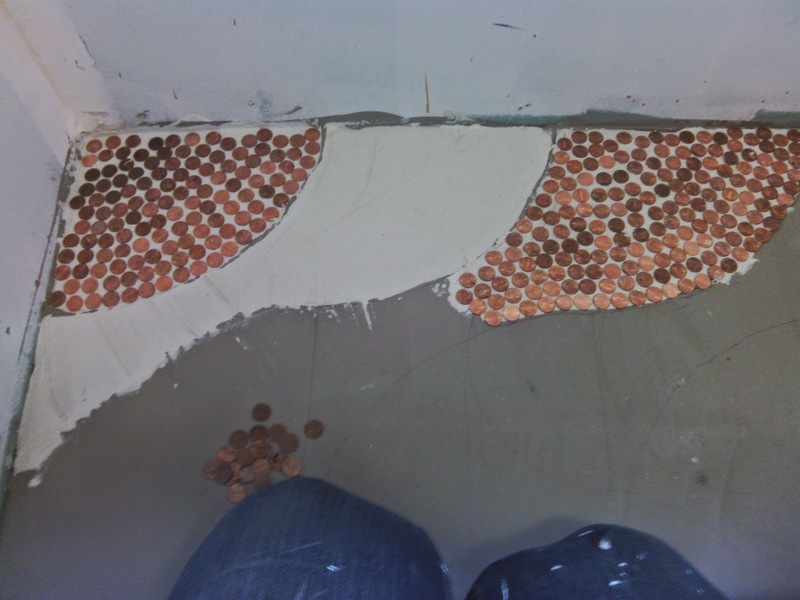 I eventually found a solution that made my happy, and used the medium shade pennies to fill in the centers of the waves, while defining my borders with the my best light and dark pennies. First row complete! Well, half row. Starting on the first full row. Step 6: Work in sections. This goes for time and for materials. but otherwise, break it up into manageable pieces. was able to stop each day knowing I didn't have to throw any mortar out. Area where my tub will go completed! One day down, one box of mortar down. Second day, second box of mortar gone. I should point out that this is probably a week later. It was rare that I had back to back days to work on things. At this point,I am also feeling like I might not have enough pennies. Also at this point, a small person decides to help my\e when I step away to make dinner and applied her own layer of mortar to the floor! My fault for leaving my mixed mortar out, but I came back to a choppy, messy, dried layer of mortar. After freaking out, I researched ways to get the mortar off. Guess what? Vinegar will take mortar off! since vinegar DOES break down the mortar and probably the grout. Now, you see in the bottom left corner the furniture looking thing? That is a little round ottoman. I found sitting low was easier on my body than kneeling. I recommend you find an equally comfy stool to sit on to do your tiling. 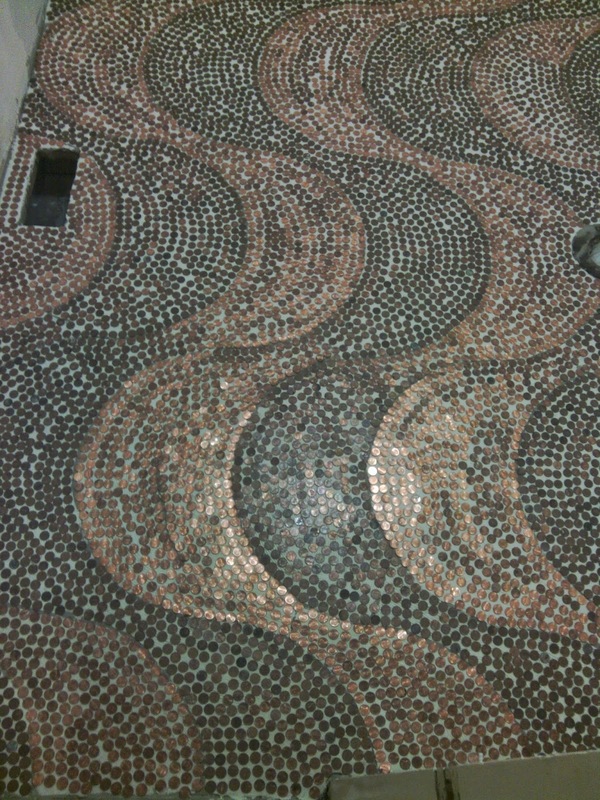 Looks like a mosaic, right? Very Byzantinian. LOVE it. to allow an adequate layer of grout to cover my mortar! my grout is a shade lighter than my pennies (the color is either Sandstone or Summer Wheat) wiping it off the excess with a wet rag, then finishing the clean up with a large sponge. so I scraped it into the trash and washed up my tools. so the wet grout can be easily removed if you are not careful. Now this is where things got... sticky. Pennies started coming up when I got to the last area. This was a part of my floor that would not even out when I poured the leveling compound. It is the reason I poured 3 layers, because it is the last area to get compound and never quite enough! Incidentally, it is also the thickest part of the floor and *slightly* higher than the rest. I had pennies coming up!! 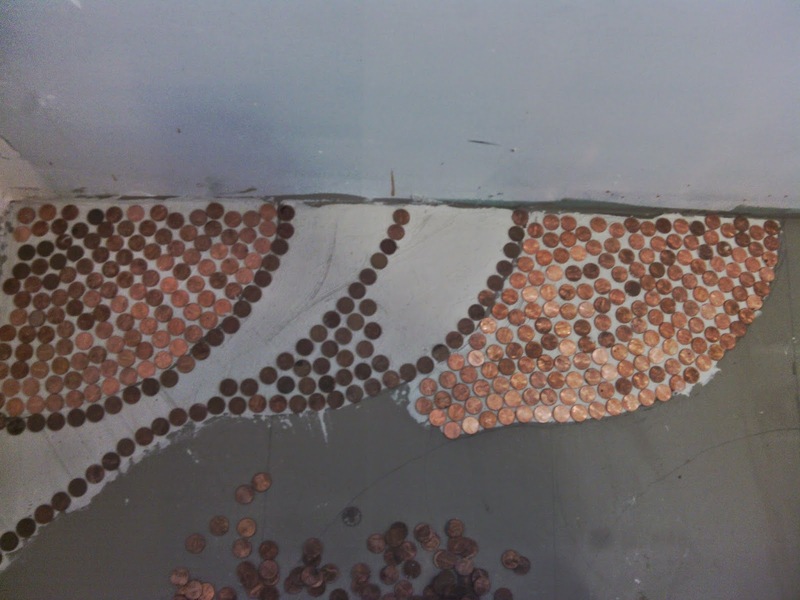 This is where I realized that THIS is why I saw people in other online penny tutorials gluing their pennies down, one at a time! 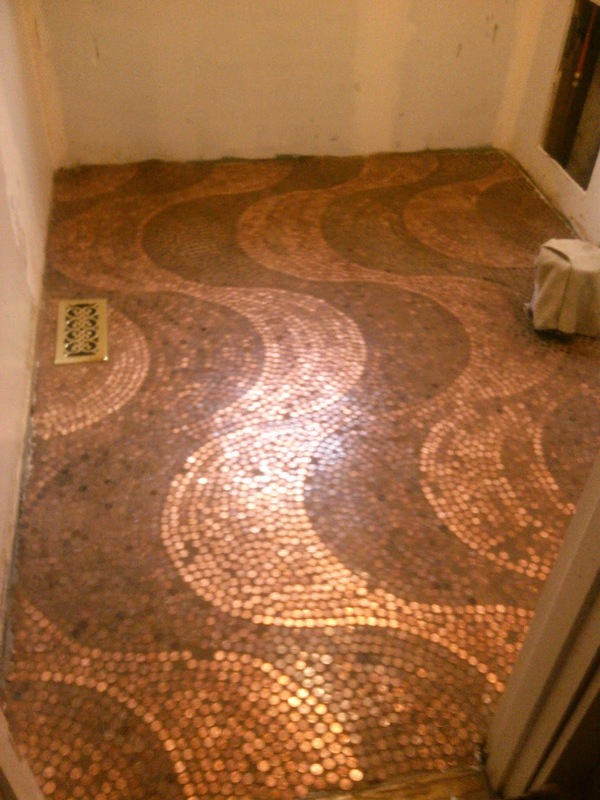 Because glass and metal mortar may not be enough to hold these little copper tiles! 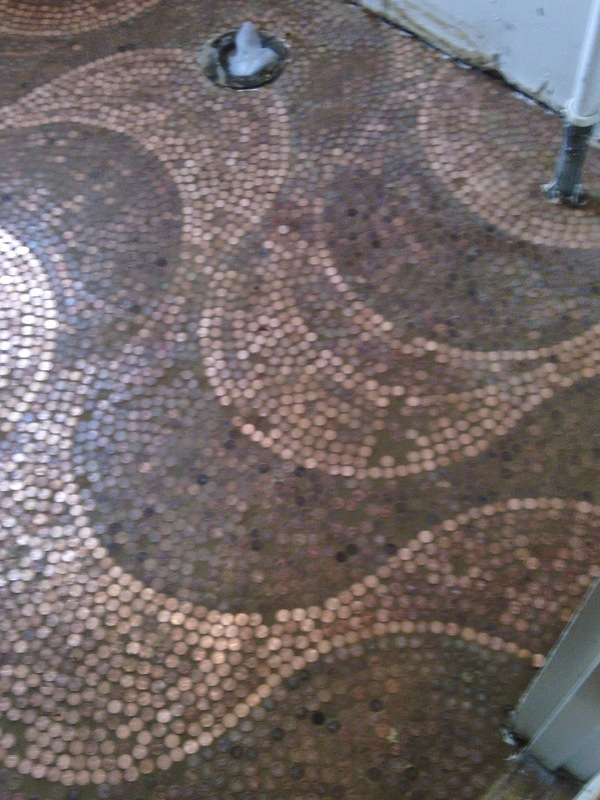 I'm not disappointed with my floor, but I do have some areas that there are no pennies, just grout! 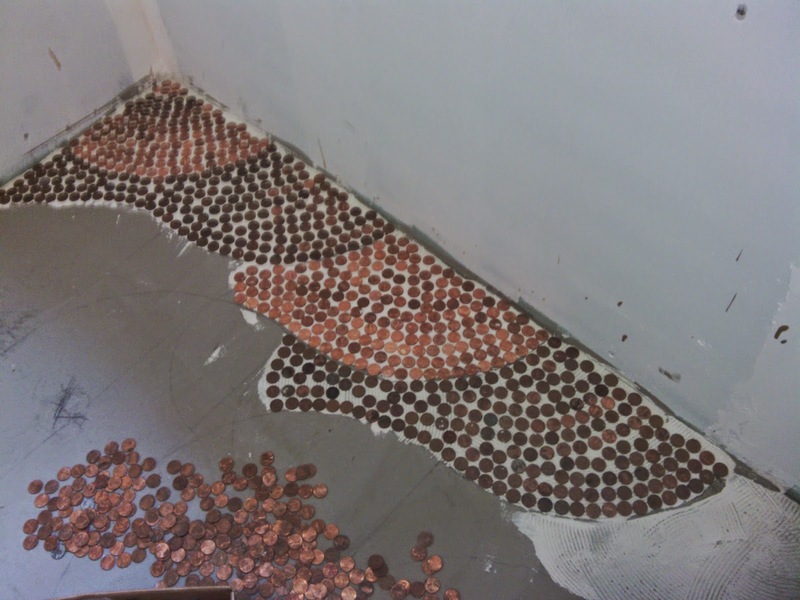 If I did this again, I would glue the pennies down. then why not glue the pennies down?! Step 8: Let the grouted floor cure for 24 hours. Wash it one more time with your big yellow sponge to get the grout dust off. Step 9: Seal the grout. off by hand with terry towels or similar. Sealant usually requires 2 or 3 coats to make the grout waterproof. 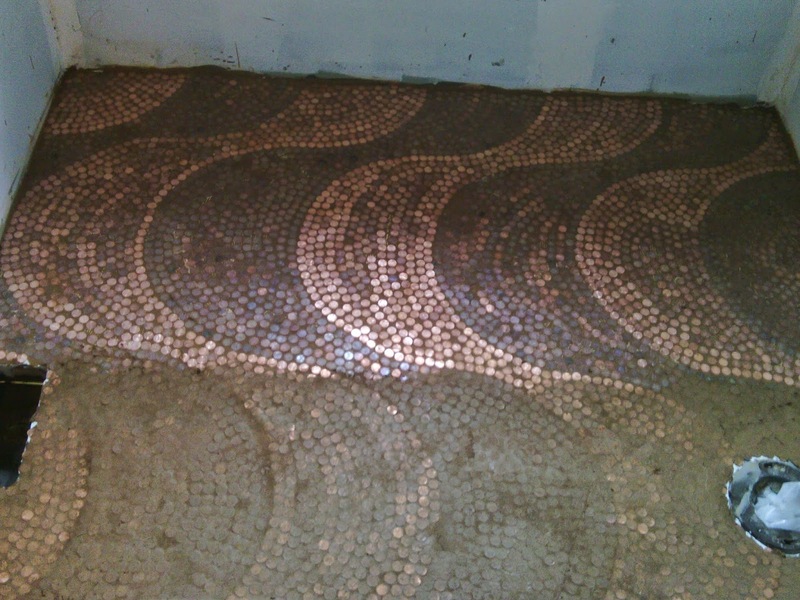 Excess sealant on your penny tiles will make them slick, so please wipe them well! be sure to apply the sealant BEFORE you put up the paneling or trim. Sealant that gets on paneling or trim will prevent your paint and any caulking from adhering. Step 1. Repair and prep subfloor for tiling. This includes pouring self leveling compound if the floor is not level. Durarock can be used over your subfloor to raise the level of the floor and provide an adequate surface for compound and tiles to be applied to. 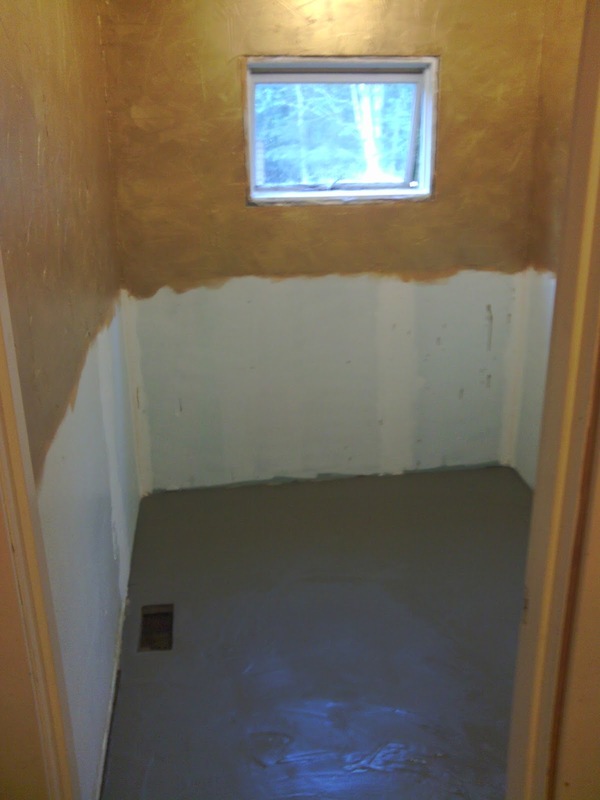 Step 2: Prime dried self leveling compound with a tile primer. Step 3: Draw out your design. Separate your pennies by shade if necessary. 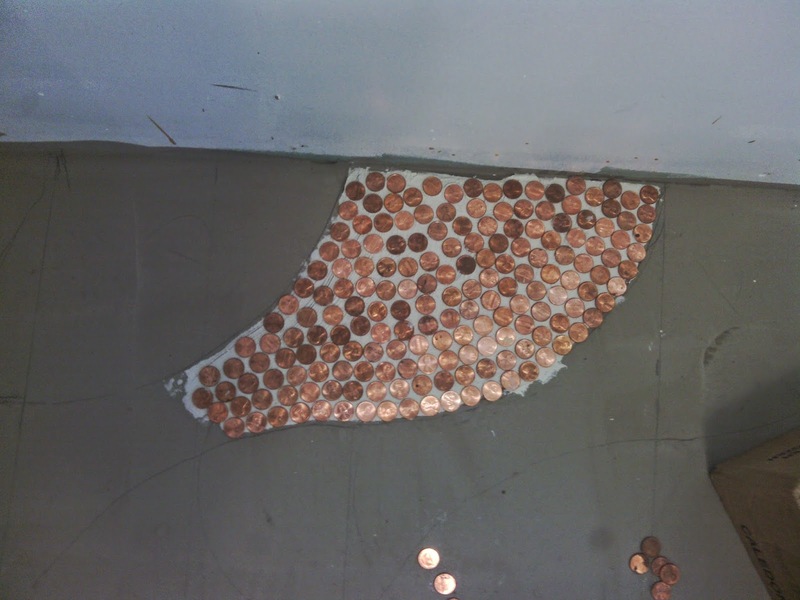 3 in one trowel and float, vinegar for mistakes), pennies, and a comfy low seat. Don't forget to ventilate the area if using glue! Step 6: Work in sections. 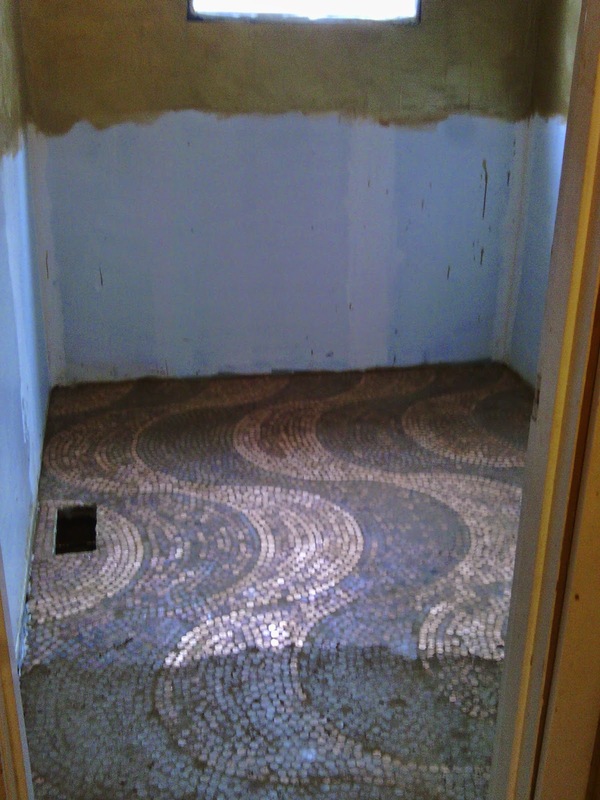 One box of mortar is about 2 hours of tiling and then it is too dried out to continue. Break the work up into manageable amounts of time so you don't waste materials. Step 7: After you have finished tiling, apply grout. Choose a color one shade darker or lighter, NOT the same color. 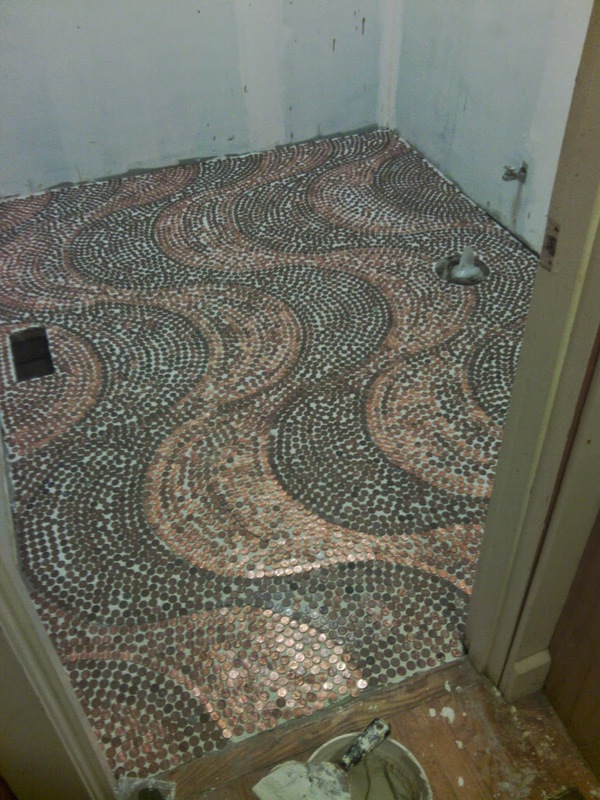 This will make your penny design "pop". Grouting a smaller room can usually be done in under 2 hours. Apply grout evenly, remove excess, wipe with sponge carefully. Step 8: After the grout has dried, wash the floor one more time with the sponge. Step 9: Seal the grout 2 or 3 times, until water beads on the grout and it does not change color. PLEASE VENTILATE YOUR WORK AREA WHEN USING CHEMICALS!! Grout sealant, glues or adhesives, primer, paint, etc. I love it... gonna do it.